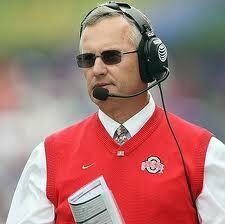 Tressel's OSU future is a big, fat unknown. Safe to say it’s not been a pleasant few days to be an Ohio State fan. On Friday night, the basketball Buckeyes let an arguably inferior opponent set the tempo in one of the most frustrating games I’ve ever had the displeasure to watch. The team’s foreshortened tourney run did well to mask what could be a much larger issue for the school’s athletics’ program; that is, the so-called “Tattoogate” that finds Coach Jim Tressel falling deeper into a rabbit hole of lies related to his knowledge of wrongdoings perpetrated by football players including quarterback Terrelle Pryor and wideout DeVier Posey. The party line from Tressel earlier this month was that he did not pass the electronic missives in question along to the school or the NCAA because he did not want to interfere with the federal investigation into drug trafficking at the tattoo joint where Pryor and Posey sold their swag in violation of NCAA rules. A revelation that he actually forwarded those same emails to Booster McGee, uh, this “influential” Pennsylvania businessman, would be another bullet in the chamber for NCAA sleuths delving into Tressel’s story. Tressel’s skidding down an increasingly slippery slope here, and who knows where it’s going to lead in terms of sanctions alone. One would think the NCAA is gleefully sharpening its claws with each successive report of Tressel’s reported ethical misconduct. Some media outlets are calling for the coach’s immediate dismissal, a move that if nothing else would shield the university from further embarrassment, or so these pundits contend. And there’s no doubt Ohio State is looking soiled on this one. The farce that was the March 8 OSU press conference not only made school president Gordon Gee into a glad-handing goofball, it also served as the moment where both Gee and athletic director Gene Smith irrevocably threw in their lot with Tressel. A poor lot that could be, as Tressel looked bad when the scandal broke in December and looks even worse on the eve of the football team’s first spring practice. One has to wonder how many more skeletons will come tumbling out of the closet during the NCAA’s ongoing investigation of the program. Here’s where things get sketchy for this Ohio State University graduate and longtime Buckeyes fan. Personally, I’ve always felt there was a touch of the slickster hiding behind Tressel’s ubiquitous vest and grandfatherly preacher persona. There’s is an undeniable history of high-profile players receiving improper benefits under Tressel’s watch. I found it difficult to believe that Tressel knew nothing of the shenanigans being pulled by Troy Smith, and before him Maurice Clarett, so any lies surrounding his players’ latest misdeeds were not much of a shock. In other words, there’s a pattern that’s emerged that belies any talk about simple lapses in judgment from Tressel. If anything, the cliché that “the cover up is worse than the crime” certainly rings true when it comes to the coach's apparent smokescreen regarding Pryor and friends. Of course, it’s easy to point to other big-time football programs doing dirt, or at least being adjacent to such unpleasantness: USC and Auburn are just two recent examples (not to mention Tennessee hoops’ coach Bruce Pearl getting fired for recruitment violations), with the Trojans set to finish its two-year postseason ban this upcoming season. OSU could be facing a similar punishment, along with a reduction in scholarships and a forfeiture of wins. That’s the scary thing for Buckeyes fans...there’s seemingly no end to this story, and the unknown quality of just how deep this thing goes is anxiety-inducing when trying to determine the program’s shaky future. That in of itself may be good enough reason to axe Tressel now. To paraphrase Chris Rock, I don’t want Tressel to get fired, but I’d understand. There are no easy conclusions here, either for the program or for fans: If Tressel goes, that will hurt the team on the field, at least in the short-term. If the administration closes ranks, protects their guy and absorbs whatever sanctions are to come, then OSU’s reputation is besmirched and the school becomes the careless “football factory” of a Buckeye-hater’s most sexually charged fantasies. Neither choice is a good one. I’m afraid that Ohio State fans will lose either way.